Simply idling into the gym and heading for the recumbent bike seems very old fashioned. More choice, however, is not necessarily a good thing - and the gym floor, with all of its complex equipment and confident lycra-clad inhabitants, can be a daunting place. Here are few tried and tested (yet easy) exercises which, when combined with a broadly healthy lifestyle, are likely to improve fitness levels, maybe shed a little excess weight - and will make you feel at home in the gym. The warm-up is a great opportunity to include some easily neglected exercises. Start by repeating a short set of just four or five simple stretches. This will ensure your muscles are taken through a full range of motion. The great thing about these exercises is that they don't require any equipment, and can be performed in very little space. People with busy lives aren't going to divide their training sessions rigidly into resistance (weights) and cardio (running, cycling and rowing). You will most probably want to cram everything into the same session. The order in which you complete the resistance and cardio components of your session is unlikely to make a huge difference. More important is not being fixed to a structure that becomes difficult to achieve at busy times and that, over time, becomes boring. My advice would be to have a rough plan of what you want to do - but not necessarily an order in which those different components will be performed. Resistance (strength) training is absolutely something you should be doing. It won't make you put on weight or become muscle bound. Nor does it have to be done while grunting in front of a mirror (although you can if you want to). What it does do is help maintain a quality of life as we age. From opening jars to getting out of an armchair - everyday tasks that rely primarily on strength. For the exercises themselves, try and include certain types of movement in each session: push, pull, rotate and brace. For example, leg exercises that fall into the push category would be squats, leg presses or lunges, while deadlifts or seated leg curls are examples of a pull exercise. The easiest way to remember which type of movement you are doing is to think about where the effort is placed - the hardest part of the leg press exercise, for example, is when you push to straighten your legs. We can apply the same logic to exercises that strengthen the upper body - consider the shoulder "press" and "lat pull down". 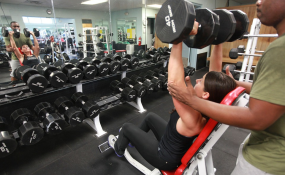 Aim for somewhere between six and 12 repetitions, adjusting the load accordingly - the more reps, the lighter the load. Rotation and brace exercises refer to those that strengthen what are commonly referred to as the "core" muscles - the ones that sit roughly below your sternum and above your hips. Rotation exercises can include twisting your upper or lower body, for example. The Russian Twist involves lying on a Swiss Ball, knees bent to 90 degrees, feet flat on the floor, and twisting to your right and left in an alternating manner. Bracing exercises are those that require no movement at all, they involve lying (or standing) while holding a stable position, usually with gravity providing the resistance. Exercises in this category include the plank and bridge which involve lying on one's front and back, respectively. They are usually performed for a set period of time, for example, 30 seconds rather than for a number of repetitions. Performing each type of exercise in a set, and targeting different body parts, will allow you to ensure variety in your routines. Contrary to widely dispensed advice, cardio training does not have to mean spending large amounts of time on a treadmill, bike or cross trainer. You can quite easily incorporate an effective bout of cardiovascular and strength training in a single 40-minute gym session by using high-intensity interval training. Divided up like this, it doesn't sound too bad, does it? The benefit of organising your training in this way is that you don't have to do it all at once. You may choose to do one set followed by some strength work before returning for your second set. This has a number of benefits, not least the ability to keep your session interesting - and without even realising it you are doing circuit training. It also means your gym membership won't be money down the drain. Neil Gibson, Director of Sport, Performance and Health, Heriot-Watt University This article is republished from The Conversation under a Creative Commons license. Read the original article.